The parents of a 3-year-old girl are demanding answers after they say a chunk of their daughter’s hair was ripped out around nap time at a suburban day care. Robin Reddick said she dropped her daughter Ariana off at a Kindercare in Oswego, Illinois, Tuesday morning. Hours later, she received a call from the day care saying something happened to the child but it wasn’t an emergency. 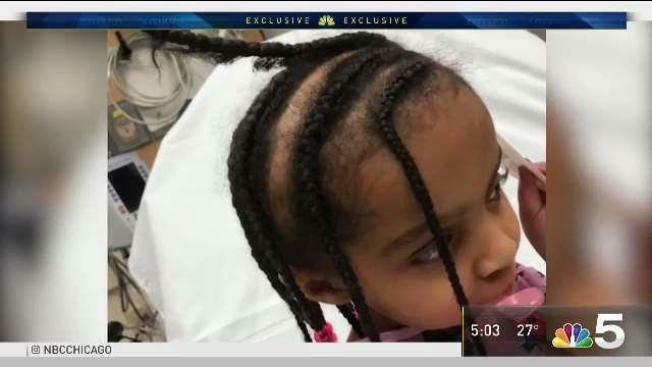 When she picked her daughter up, she said she saw an entire braid had been ripped from her scalp. Reddick said Ariana’s teacher and the day care only told her they noticed the hanging braid after nap time. The couple took the child to a doctor, where they said they were told something forceful had been used on their daughter’s hair. They also spoke with DCFS and filed a report with police. “How does something like this happen in the care of the facility?” Reddick said. In a statement, Kindercare said it became aware of the loose braid and called the child’s family. “Although no injury occurred, we also reported the incident to state licensing, so that they may look into the matter for themselves, if they so choose,” the statement read. The family said they want answers.